Behind some of the biggest challenges we face today, is the serious issue of human overpopulation. As our population grows from 7 billion to 10 billion, so to grows our impact on the planet. As the worlds population increases so naturally does our requirement for increased resources. Create more pollution and waste. This creates more pressure on our rainforests and wilderness areas which support other animals on the planet and is driving climate change and the 6th mass extinction. Emerging infectious diseases are also an issue as we intensify animal food production and force wild animals out of wilderness areas. Your mission - Tully, Luca and Thomas are all from one child families. Small families are good for our planet. Learn more about the issue of overpopulation from the links below, and then tell others about it. If you have a great project which you need funding, visit our Fund your Mission page in the menu. Population Matters - promoting population concern, family planning, environmental conservation and sustainable lifestyles. Patrons include David Attenborough and Jane Goodall. What's your number? How many people were on earth when you were born in comparison to todays 7.3 billion? 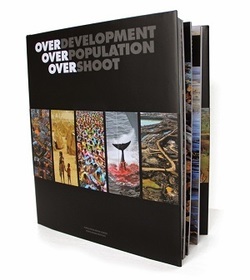 Global Population Speakout - Overdevelopment, Overpopulation, Overshoot (OVER) - a stunning photographic book which tells a visual story of how our increasing numbers are impacting on our planet. Join the campaign to spread the word! Raise awareness in your own community and tell us what you did - we have 2 copies of OVER to give away to the best awareness (most creative and effective) effort!